This blog is dedicated to sharing the concept that our hands are essential to learning- that we engage the world and its wonders, sensing and creating primarily through the agency of our hands. We abandon our children to education in boredom and intellectual escapism by failing to engage their hands in learning and making. 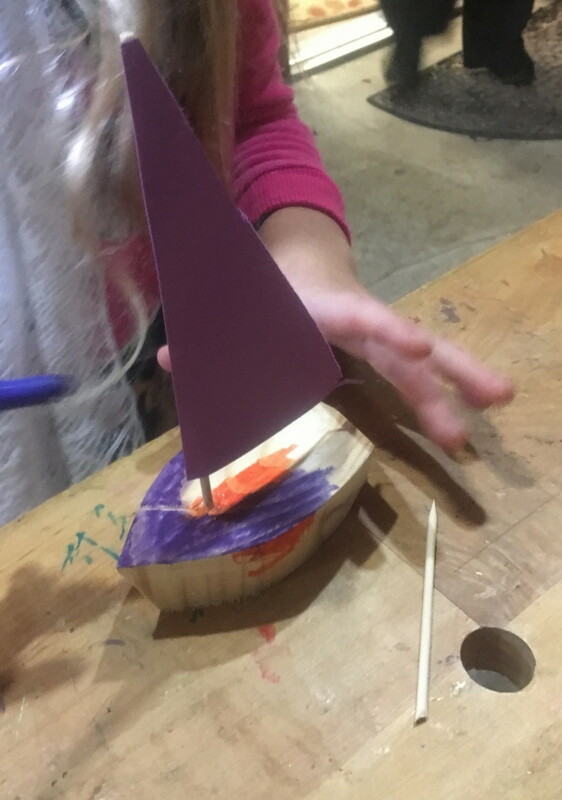 Yesterday at the Clear Spring School harvest party I set up a boat shop for children to make toy sailboats. I prepared for the event by making a bunch of small boat hulls cut out from 2x4 lumber stock. I made a small cardstock template which I used to trace the hull shape on wood. If you fold cardstock and use scissors to make a cut through both sides at the same time, you end up with a perfectly symmetrical shape. This is similar to the technique used by real boat builders using a half-model to design boats. To make the boat shapes more boat like, I tilted the bandsaw for making the cuts. The students and I drilled the holes for the masts to fit, using our small drill press and a step stool to bring the work into reach. The masts are bamboo grilling skewers and the colorful sails are cardstock glued to the masts with hot melt glue. As a student from the 50's and 60's the importance of voting was made clear. These days, and in stark contrast, one particular party has been working very hard to deprive certain people (the poor and racial and ethnic minorities) of their rights to vote. That whole political strategy offends me at my core. There are some things you learn from woodworking, most particularly when you are trying to use it to be of service to others. These are forgiveness, compassion, empathy, and love. None of these qualities compels one to trample on the rights of others or to allow others to do so on your behalf. All of the materials used here are copyright Doug Stowe. Photos of our students at work are published solely for the promotion of the Wisdom of the Hands program and Clear Spring School. Other uses are strictly prohibited and copyright will be enforced. what do the girls do? Doug Stowe's WOH articles and papers. All text and photos copyright © Doug Stowe 2006-2013 These materials are not to be copied without author's permission.